Current Inventory and Coming Soon! As of today I’ve got all my current stock of bracelets and necklaces up but for four. I should be taking those photos soon. I also need to finish up the Zonnetje pendant and take photos of that one. But here is a sneak peek of the work in progress. 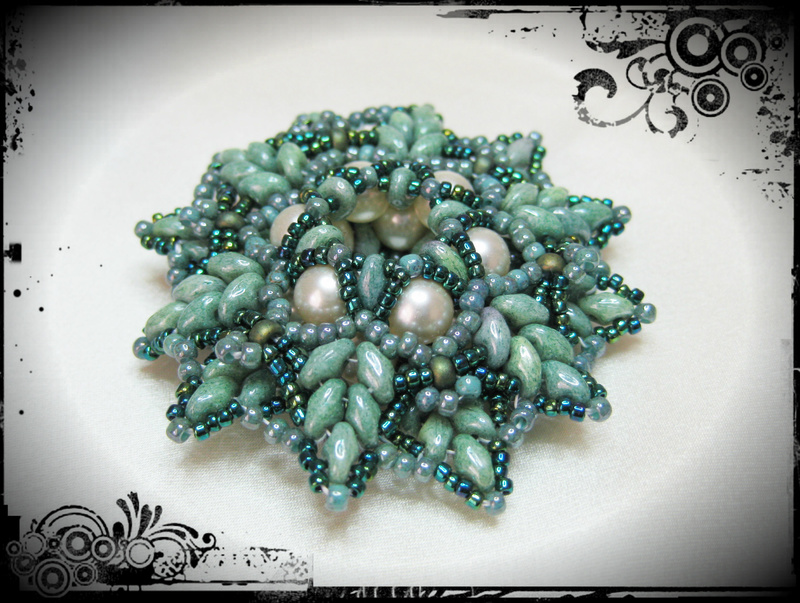 It’s a beautiful pattern by EllaD2, the colors remind me of the ocean. I’ll be adding a chain and a few hand-stitched beads to finish it off. I’m finishing up the Morning Glory pendant this afternoon if all goes well. I still have to take photos of the earrings and post those, I need to find the best way to photograph them, but the sun isn’t out today so it will have to wait until she returns. I have so many ideas to take to the workbench, this is just the start! I’m looking at a line of phone covers as well, as I have found a lovely set of cross stitch phone covers that would work fantastically with beads! I need to check to see if the local store got any of the Green Iris Superduos yet so I can finish the first Kyra Bracelet I started. THAT one is a beauty!